Learning for life is a broad term that encompasses many facets and is the motto of Powhatan School. In this year’s series of letters to the Powhatan community, Head of School Sue Scarborough highlights how this mission is more than words. It is alive and well each day in the classrooms, playing fields, hallways and courts at Powhatan School. Lead (led) v., 1. To go before or with; to show the way. 2. To conduct by guiding. Some students are natural leaders and others cultivate this skill by practice and opportunity. At Powhatan, we believe that all students have the capability to lead and whether you are a natural or a novice there are many times throughout the grades for students to step out of their comfort zones, build confidence, and take on this role. It starts small, but the end result is big and the journey is very intentional. A leadership hat can be worn in many ways and my letter this month will highlight just a few of them. 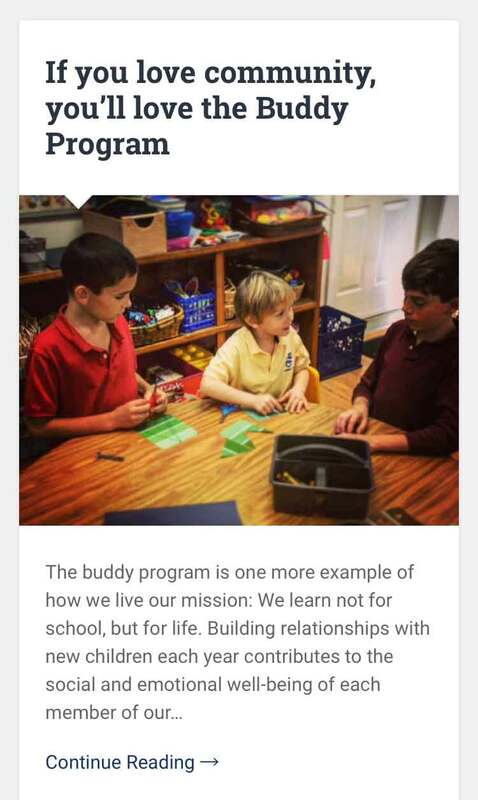 Click on the image above to learn more about the Buddy Program. The class buddy program is a great way to inspire leadership in students of all ages. Older students play the role of brothers and sisters to younger students. They model this role whether they are in third grade or eighth grade by reading to younger students, playing with them on the playground, and acknowledging them in plays and athletic events. Older students write to younger buddies introducing themselves through writing first, then actually spending time together. Great communication skills are developed as well as positive role modeling – both skills that every leader needs to possess. Field trips beyond the classrooms and campus are another way that students build leadership skills at Powhatan. Starting in third grade, our students take overnight trips to Williamsburg, Charlottesville, Baltimore, The Chesapeake Bay, The Shenandoah River and Harper’s Ferry. Being away from your family on an overnight trip at the younger ages builds independence and self-reliance by learning how to take care of your own possessions, sharing a room or tent with another student, and trying a new food – or maybe even cooking it yourself! By the time our students reach the upper school, they are confident travelers, ready for new experiences and exploring different places. Many adults fear public speaking. That rarely happens at Powhatan since our students are used to speaking in front of their classmates since Pre-Kindergarten. Whether it is a book chat, project presentation, play, or Chapel Talk, both written and spoken communication is a key component of a Powhatan education. Students speak at Monday Morning Gatherings, class meetings, and grade level presentations. The capstone of this journey is the eighth Chapel Talk given to the whole school about a passion or meaningful experience a student has had in their lives. Leaders are confident communicators and Powhatan students have been working on this skill since age five. Finally, there are the more traditional opportunities for leadership such as post and rail captains, student council leaders, student council class representatives and athletic team captains. These roles appear at the upper grades and are most visible. They require a strong work ethic and job commitment. They also require learning the give and take of working with others to achieve a common goal. These roles can also be a part of building confidence at Powhatan. 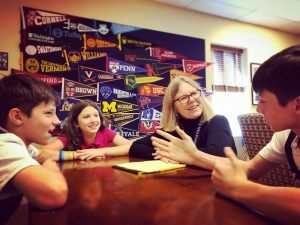 This fall, three seventh grade students had the opportunity to be “Head for A Day” and after their experiences, I asked them to sit down with me to talk about how it felt to be the leader of the school. Listen to the podcast at the top of the page to hear their thoughts on leadership. Confidence building is a steady daily process at Powhatan. Small steps grow into bigger ones as students move through each grade. A variety of experiences provide all students with the tools for leadership. And learning to lead is just one of the many ways we are all “learning for life” at Powhatan.